Jody Kieran, the owner of the US-based bird rescue and rehabilitation centre Fallen Feathers, tells Gizmodo that the male pigeon came into her care about last Sunday after someone in her community contacted her about a bird outside of their home with something odd on it. Kieran told the caller to catch the bird and bring it on over. When they showed up with “the pigeon wearing the thing,” Kieran said she wasn’t sure what to expect. Flight suits are used to capture bird poo while the bird is out of its cage. 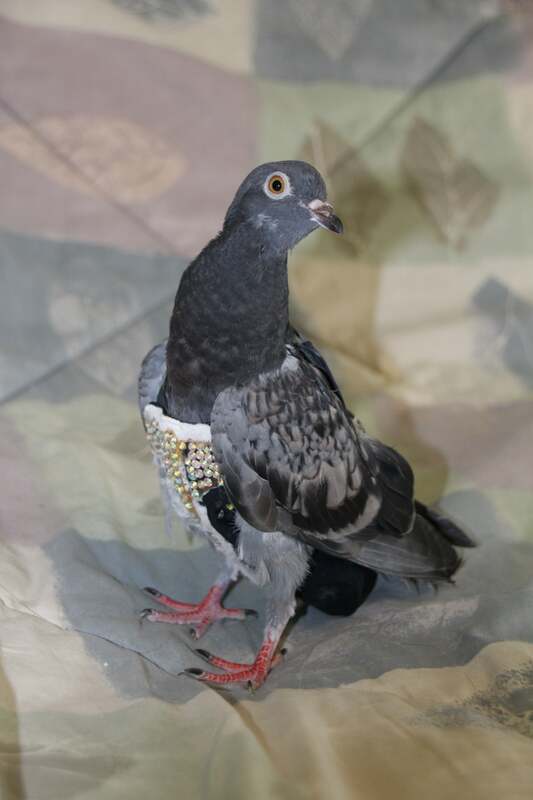 They’re basically bird nappies, but more stylish, as is evident by this pigeon’s rhinestone-adorned vest. And assuming it didn’t bedazzle its own flight suit, it’s clear it belonged to someone who probably cared about it.